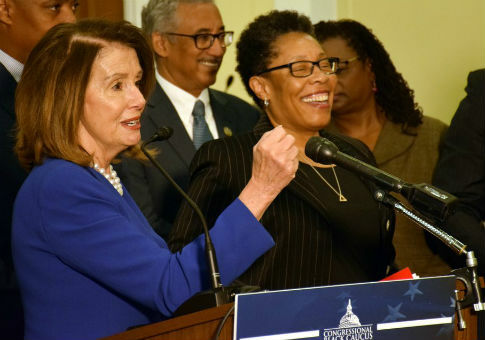 Rep. Marcia L. Fudge (D., Ohio) is being floated by several Democrats as a potential contender to face off against House Minority Leader Nancy Pelosi (D., Calif.) to determine who will be the speaker of the House when Democrats retake the majority in January. Fudge, a former chair of the Congressional Black Caucus, sat down for an interview with the Washington Post on Thursday, telling them she has been "overwhelmed" by all the support she's received from some of her Democratic colleagues, including Reps. Tim Ryan (D., Ohio) and Seth Moulton (D., Mass.). She told them there are "probably closer to 30" Democrats who have privately told her they would be willing to vote against Pelosi. Moulton publicly praised Fudge Wednesday night and Thursday morning on CNN, saying she is "the kind of new leader that we need in this party." "She’s in touch with middle America. She understands what the American people want," he said on Thursday. "She’s a next generation leader that people will look to and say, ‘That’s the future of our party, that’s the future of our country, and that’s exactly the kind of leader that I want to see as our next speaker.’"
As Fudge mulls a bid to challenge Pelosi, prominent Democrats like former Attorney General Eric Holder and members of the Congressional Black Caucus, including Reps. Bobby L. Rush (D., Ill.) and Maxine Waters (D., Calif.), have come out in support of the current minority leader. Fudge said she would be a thorn in President Donald Trump's side by holding him accountable, but also said she would seek to work with him, noting she views Trump as someone that cares about "winning" and being transactional versus ideological. "I’ve been in government a long time and understand how it works. And he doesn’t. So I’d be happy to help him understand how it works," she said. While Fudge has a bloc of Democrats who privately support her, some Pelosi allies have criticized Fudge for not co-sponsoring the Equality Act, which "focuses on civil rights protections for sexual orientation and gender identity," according to the Post. Fudge also spoke to HuffPost Thursday, telling them she doesn't "Hate Nancy" and that she has been "a very good leader." However, she believes "it’s time for a new one." She went on to talk about how she doesn't believe Pelosi has been vocal enough about supporting African Americans in Congress. "I don’t have a pitch because at this point I’ve not decided I’m going to run," Fudge said, "but I would say this: My concern about the caucus is the same concern I have about the country. Just as there is this undertone of racism in the country, there’s also that in our caucus." Fudge pointed to Pelosi’s refusal to endorse in the race for majority whip, a contest between the current No. 3 Democrat ― and CBC stalwart ― Jim Clyburn (D-S.C.), and Rep. Diana DeGette (D-Colo.). "But she wants our endorsements?" Fudge said of Pelosi. "Who has she endorsed?" "We’re not feeling the love," she added. Democrats will vote internally on their nominee for speaker on Nov. 28 and the full House will vote in January. Earlier this month, Pelosi expressed confidence she will be the next House speaker. This entry was posted in Politics and tagged House Democrats, Maxine Waters, Nancy Pelosi, Seth Moulton. Bookmark the permalink.